Immaculate Conception Cathedral - Stained Glass Inc.
It’s not every day that a new Catholic cathedral is built but when older buildings begin to erode and show internal and external wear from natural conditions, sometimes renovations aren’t enough. 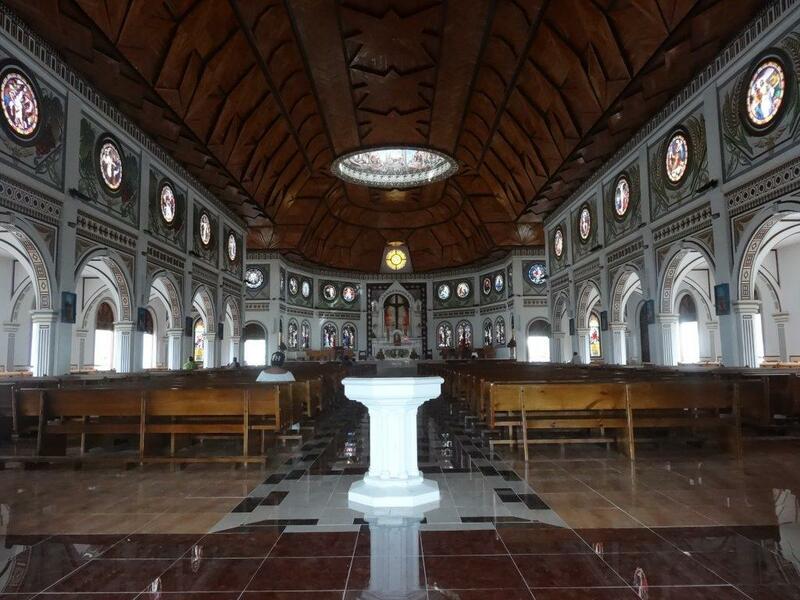 This was the case with the Immaculate Conception of Mary Cathedral in Apia, Samoa. Tropical cyclones, earthquakes and the constant vibration from heavy traffic nearby had, over time, wreaked havoc on the structure. Even after previous renovations, the 125 + year old cathedral was falling apart. Subsequently a building assessment by the Structural Civil Engineers determined that the building was unsafe and could not be saved, so the Church decided to pull the old cathedral down and rebuild anew. Church stained glass is a traditional decorative characteristic dating back to medieval times that is featured in cathedrals all over the world and the Immaculate Conception of Mary Cathedral is no exception. For the huge cathedral, builders needed a stained glass supplier who could not only create beautiful works of art but could also handle the immensity of the project. At Stained Glass Inc., our production facilities are large enough to accommodate jobs of any size. Stained Glass Inc. worked extensively with Immaculate Conception to ensure that each individual window was perfect. When the archbishop requested to meet with a Stained Glass Inc. representative, Stained Glass Inc. president, Lyndon Stromberg, flew to Samoa to meet with him in person. Mr. Stromberg met with the archbishop along with the Cathedral Project Committee, including the parish priest and the project builder to discuss Stained Glass Inc.'s products and show them samples as well as design options. He assisted with measuring the windows and making templates which he brought back for production. Although the archbishop chose many designs from our online gallery, all of the designs were customized with matching borders created by our stained glass artists and Bible verses chosen by the Cathedral Committee. Aside from the designs selected from our gallery, Immaculate Conception also wanted the Stations of the Cross illustrated in stained glass. While we didn’t have a set of designs featuring all of the Stations, Stained Glass Inc. custom designed 14 images that perfectly matched the client’s request. Whereas all Catholic churches feature the Stations of the Cross, usually depicted in pictures or with sculpture, it is rare that they are portrayed in stained glass. These spectacular designs add a unique and faithful touch to the newly erected cathedral. While our most frequently ordered product is stained glass inserts that sit behind regular glass windows, Immaculate Conception ordered their stained glass to be used alone without the use of standard window glass. To ensure that our windows provided proper insulation and held up to the island’s tropical weather, each individual panel was surrounded by a thick wooden frame rather than the standard aluminum framework and a custom installation process was created for these windows, in which the frames are attached with the use of screws. Stained Glass Inc. provided an installation video as well as illustrated step-by-step instructions to help guide installers. We appreciate and [are] grateful for all the hard work you are doing. In all, Immaculate Conception ordered 206 windows ranging in size from 12” x 14” to more than 10’ x 10’and totaling over 2,800 square feet of stained glass in all. The windows were packed along with all the tools and supplies needed for installation and shipped via boat to Samoa. All windows arrived safely, without any breakage or other problems. Those working on the cathedral found mounting the windows very simple and the windows were installed quickly. The addition of stained glass to the new cathedral is very exciting. During installation the coordinator for the cathedral windows, Vincent, was thrilled. “The windows are going up at the Cathedral and they look absolutely magnificent”, he said. The artwork is “…the perfect style...” for the cathedral, matching the overall design concept and adding stunning detail and brilliant color in Christian symbolism and realistic depictions of Biblical accounts. Designs for the church windows include many significant events and saints of the Catholic faith, including the Last Supper, Jesus Blessing the Children, the Resurrection, the 4 evangelists, the Crucifixion of Christ, the Stations of the Cross and the Coronation of Mary as well as numerous other Biblical depictions. Our artists painstakingly fashioned every detail of each design and created custom, matching borders that were placed around the images to give them a uniform look that ties them all together.